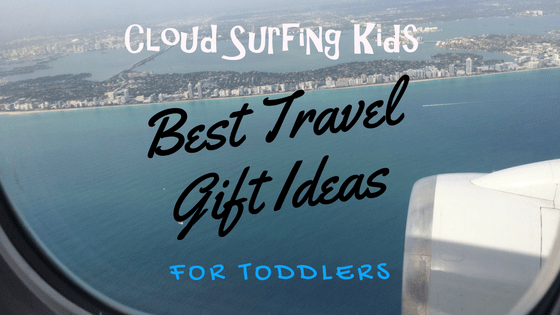 If you’re looking for travel gifts for toddlers, I’ve got you covered! Here I list 23 of our favorite toys, equipment, and food ideas for your traveling toddler. I go beyond the standard suggestions with lots of unique ideas. Which ones are your favorites? I’d love to hear from you in the comments below. Every Tuesday on this website I post new travel tips. Be sure to subscribe to email notifications (in sidebar) and follow us on Facebook, Twitter, or Instagram. What aspect of family would you like me to address? This is a great little package with lightweight foam and plastic toys to keep your toddler busy! For your flight busy bag, remove the items from the box to save on space then pack them in a Ziploc bag. Have you ever noticed that the simplest toys (and non-toys) are often a toddler’s favorite to play with? This simple activity of nuts and bolts might occupy your toddler longer than anything else! Even if it occupies a busy toddler for ten minutes it will be worth it! How cute is this!? It has 5 different style clasp buckles on the underside and a zipper across the front. Note the size is 9″x 6″. If your carry on bag is already full you could just clip it to the outside using a Carabineer “D” Clip. This was one of my son, John’s very favorite things to play with in flight! 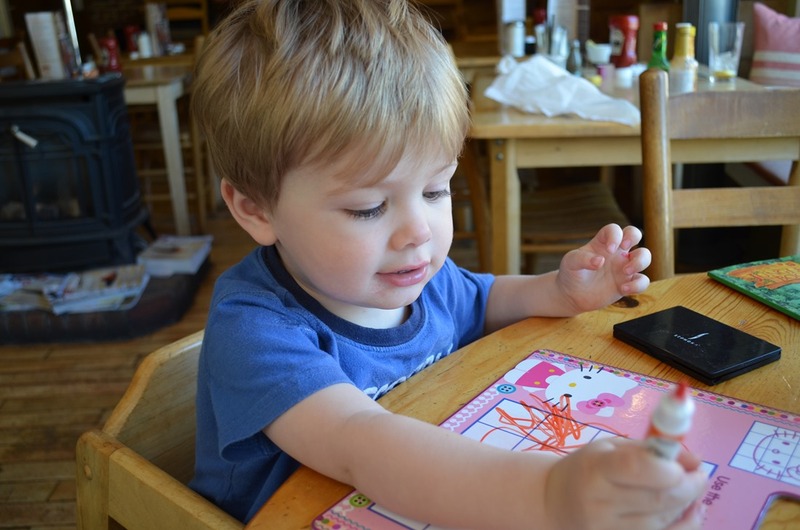 As I wrote in this post: 5 Ways to Entertain Your Toddler in Flight, between making faces at himself in the mirror and coloring on the mirror with dry-erase markers, this little item kept him occupied for long periods of time. You can use these to color on the mirror or on a window. I’ve even used them to write on glossy board books (remember to erase right away because if it’s left on for a long time it won’t erase). Crayola makes dry-erase crayons too, but I actually found them to be messier than markers. I love this little fidget! It’s super-lightweight and is really fun for all ages to twist around to create new shapes. I bought this on impulse when my son, John was two years old. He’s almost four now and still loves to play with it. It’s fun to have something airplane themed when you’re flying with your toddler, and small figures can offer endless opportunity for imaginative play. Available in Frog, Cat, Bear, or Pig. 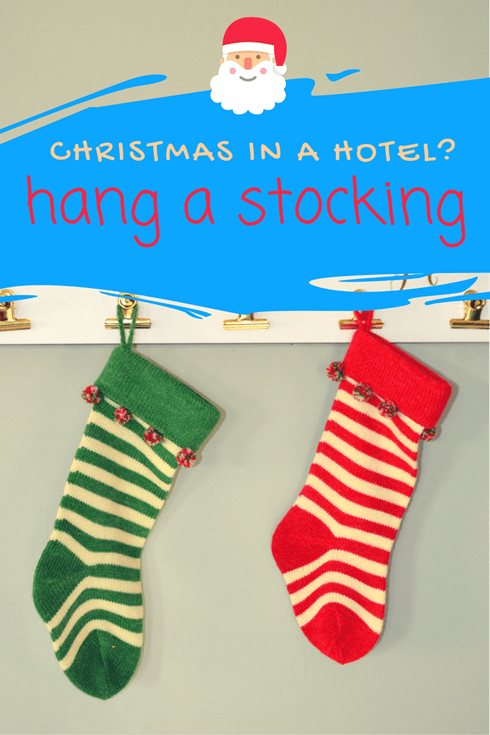 It’s a great all-in-one gift! There are several DIY toys you can do too! Among our favorites are a drop-toy, made of an empty spice jar and straws or toothpicks, or of an empty mini Pringles can and pipe cleaners, straws, buttons, or paper clips. Instructions can be found here and here. I also make this drop-toy, using airplane galley supplies, for restless toddler/preschool age passengers when I’m working as a flight attendant. Pack a just a few of these sticker scenes in your busy bag along with a few sheets of stickers. If you’re not bringing the car seat on the plane, this C.A.R.E.S. Harness is the safest way to fly! This is the only FAA approved airplane harness, designed for children ages 1 and up, weighing 22-44 lbs. and up to 44 inches tall. You can check your car seat at the ticket counter (free of charge as an assistive device), or use the Go-Go Babyz Travelmate (my favorite travel tool) and check your car seat at the gate, then just walk on the plane and easily install this C.A.R.E.S. Harness. Easy to use, it keeps your child more safe and secure. For my kids it gave them more of a signal that they needed to stay seated. I was so grateful that I had my daughter, Ella, safely buckled in this when she was about 3 years old and after takeoff we encountered wake turbulence. Everyone rose an inch or two out of their seats as our plane dropped. The C.A.R.E.S. Harness keep her securely in her seat. Some passengers screamed, but Ella lightened the mood when she cheered, “Let’s do that again!” For her it was like a fun roller coaster ride. This is my all-time favorite piece of travel equipment. It quickly transforms your car seat into a stroller as you attach the plate to your car seat with a quick-release ratchet strap. The telescoping handle is adjustable for your comfort. Read my complete review of the GoGo Babyz Travelmate. They have updated this with a fold-down plate to accommodate the larger car seats that are common now. Toddlers often won’t tolerate regular headphones but on the airplane they need to use headphones or turn off the volume when playing video games or watching shows. These headphones are a cozy headband and reviews show that kids are far more likely to wear these than regular headphones. I like that they don’t take up as much room in your carry on bag as regular headphones would. 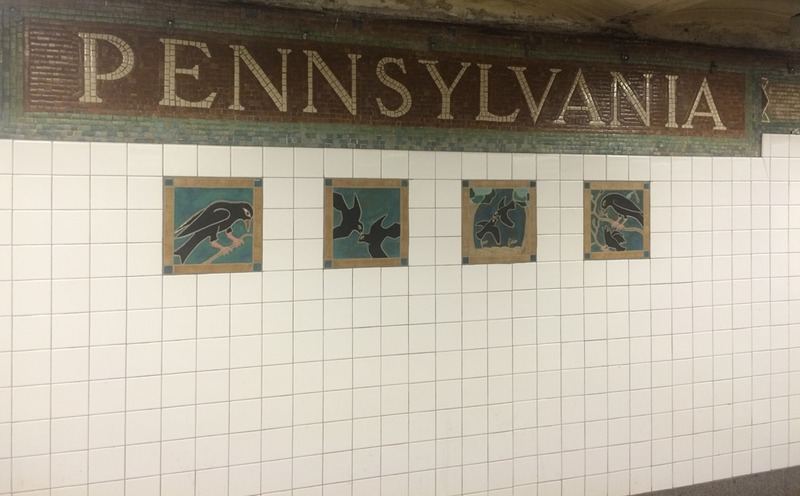 Several styles available, including frog and penguin. I love these not only for the purpose of keeping germs away from your child, but also because they have activities on them! Another thing to help occupy your toddler! I like this folding travel potty because of the handles feature, which keeps your toddler from grabbing the toilet. TRAVEL TIP: When using public toilets, cover the automatic flush sensor with a sticky note or sticker before your child sits down. This will prevent it from flushing and terrifying your child. Read my tips on Managing Public Restrooms with Your Young Child. Toddlers love the independence of having their own bag to carry their things, but we all know that after about 15 minutes you will be the one carrying the bag. This cute little rolling backpack is small enough for a toddler to comfortably wear it on their back when they get tired of rolling it. And it’s easy to toss over the handle of your roller board when your toddler isn’t up for carrying it. TRAVEL TIP: I pack all the busy bag toys in a gallon size Ziploc bag and then put it in this rolling backpack. This small backpack easily fits under the airplane seat and can often share the space with my tote bag. Your toddler wants freedom! The new challenge arises of keeping your child safe in crowds. Read my post, How to Prevent Losing Your Kids in Crowds, for some ideas on keeping your child near you. One way is by using a safety harness, like this one. Worried that people will judge you? Don’t be! Read my post, Backpack Harnesses, Useful or Mean? to get more information on what most people really think. I’ve tried a lot of different novelty travel snack cups but I always went back to this simple design. It was the most spill-proof and easy to use one for my kids. Is there a more perfect toddler food than a banana? To keep the banana fresh and bruise-free, use this banana saver. I have even packed bananas in my checked luggage using this and they have not had one bruise! These little freeze-dried snacks are pure fruits and veggies–no added sugar! It can be tough to get your toddler to eat well on-the-go. These fun snacks can help add a few nutrients to your child’s diet. I always bring a spill-proof cup for my kids when flying. These cups are inexpensive enough to toss if you can’t wash them and durable enough to wash and reuse when you’re able. Even if your toddler is still nursing, they will probably like to have a drink of water when the beverage cart comes by and everyone else is getting drinks. What do you think of this list of travel gifts for toddlers? Do you have favorites that I missed? I love it when readers comment! Let me know what other things you would suggest. Flying with toddlers can be fun, but age 1-3 is probably the most challenging age to deal with then traveling. Since toddlers are less able to express themselves than older children, they can get easily frustrated and act out. Toddlers have an unbelievable amount of energy and hate sitting still, so keeping them occupied and happy in flight takes some effort. But don’t fear! You can do it! My children are really active. When my husband and I describe the activity level of our kids, people respond with, “Yeah, yeah, kids are busy!” Then they meet our kids, and as the kids run around like Tasmanian Devils, our friends say, “Oh! Now we see what you mean!” And yet, I’ve taken over 75 flights with them during the toddler stage, and we survived! Most of the flights I was solo with them and I enjoyed it (most of the time)! 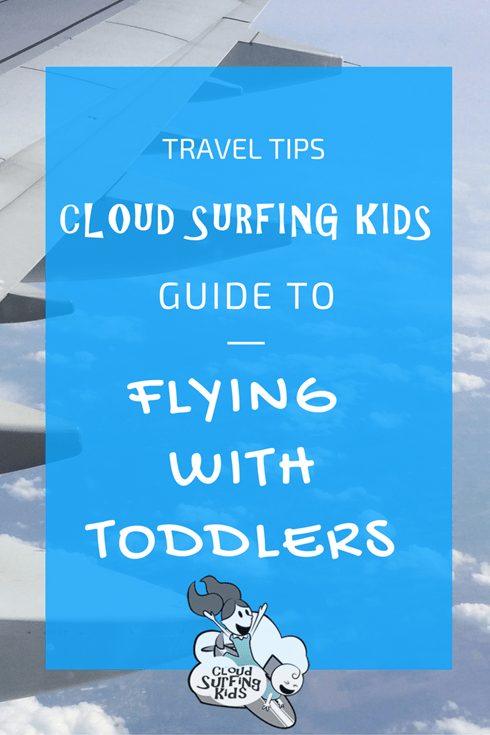 So in this post I’ve collected all I’ve written to date about flying with toddlers in hopes that my tips will help you when flying with toddlers. 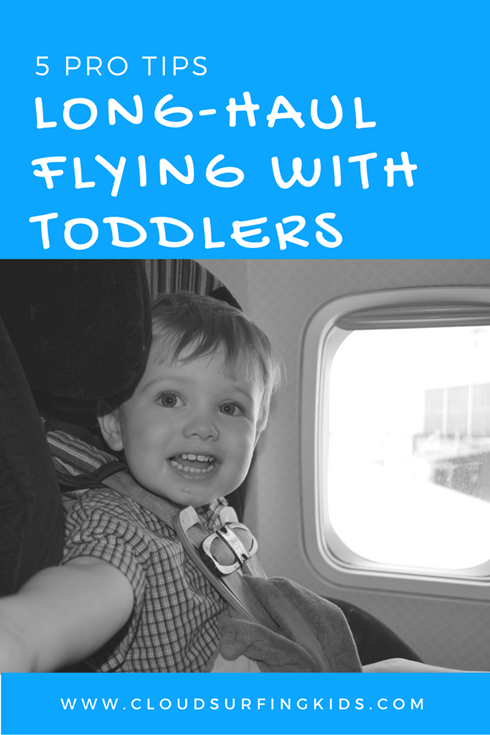 I’ll update and add to this post as I write more about flying with toddlers. Pin or bookmark this post now for reference! 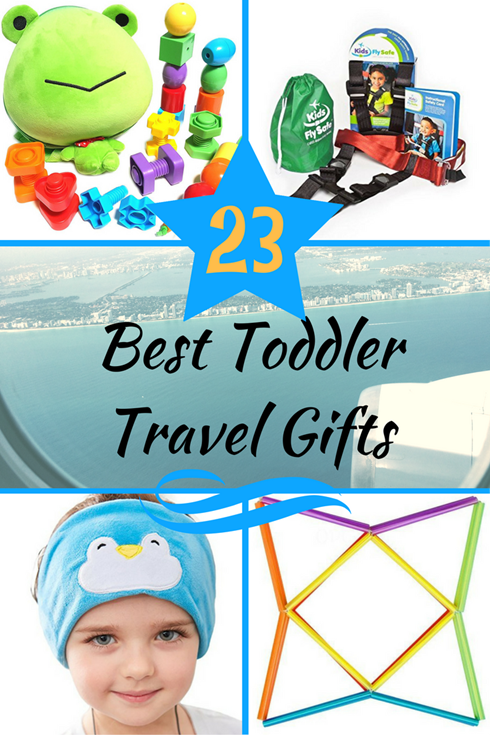 Click the image for 20 Travel Gift Ideas for Toddlers! Backpack Harness: Useful or Mean? 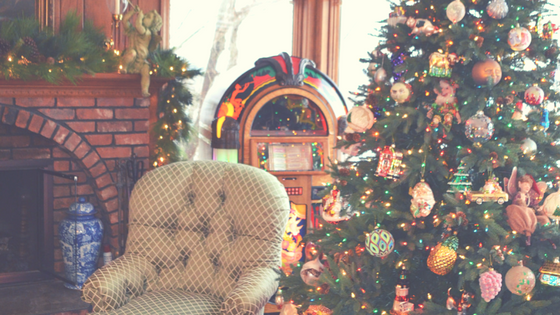 Here are some of the best travel gift ideas for infants I can recommend. From clothes to toys to equipment, they’re all things that will make family travel more pleasant. If your infant tolerates hats, this is the best! Once the baby falls asleep just fold down the flap over their eyes! I had this for my son, John, who was colicky and wouldn’t sleep during the day, and he actually slept (while being held) at a birthday party! This will keep you from cursing the flight attendants when they turn the lights up before landing. Turn your infant carrier into a stroller! This Deluxe Cruiser can also grow with your child: when you add the adapter kit it can be used with a convertible car seat! Read my review of this here. Infants don’t need too much for entertainment, but they can get bored. Bring a few small toys for them. Something to keep in mind: avoid noise makers. Consider the passengers around you and don’t bring electronic toys or squeaking toys. Even infants enjoy a good book! But don’t add to the weight of your bag with board books, just pack one soft cover book for reading to your infant. If you have an infant who needs lots of stimulation, you will want to pack something for your baby to play on when you’re at your destination. For some of you, packing something like this is a little extreme, but for my first born it was necessary. She needed overhead toys/stimulation and lots of variety. It was so worth it to pack her activity gym in my checked rolling duffel bag. This was another life saver with my very active infant. A clip-on mobile provided lots of great stimulation and kept her more content when we were on-the-go. Attach toys to your stroller or car seat so they don’t drop on the floor. Or just use these rings as toys themselves! The varied textures and colors make for interesting toys for all babies. I was so happy using this travel crib for my son. I used it for him from age 1-3.5. We even used it for him daily for six months while living with in-laws as we were waiting to buy our house. He was very comfortable in it! Set up is easy and only takes about a minute, which is so nice after a long travel day. Another clever invention! You don’t have to worry about this dropping on the airplane floor. These leg warmers are great to have on hand for warmth. They can be used on arms or legs, and slide easily on and off, even if your baby is strapped in the car seat. We had these and my daughter used them up to age 6 on her arms! These little crib shoes stay on! If you’re tired of shoes or socks falling off, these are the solution. It’s all I used for my daughter until she was walking. So many infant socks slide right off, but these Trumpette socks stay put. They have lots of cute styles that mimic shoes. Cute and cozy! This is the most versatile baby blanket I have used. It can be used for swaddling, warmth, a nursing cover, and a car seat cover. I would even pack two for my flight. I loved this diaper bag when traveling with my infant son! The front flap unzips and turns the bag into a baby carrier! It’s so convenient when flying! You can read my review of the Sidekick Diaper Bag/Baby Carrier here. *Note: this does not offer enough support for a newborn. Your child should be in the sitting stage to use this as a baby carrier. If you’re traveling with bottles, this little brush and drying rack is perfect! You can put the baby food in this holder and squeeze on bite at a time into the spoon. I used it for both my kids and it was so convenient! I love these NurturMe Dried Organic Food Pouches! Packing these instead of purees allows you to not have to worry about TSA liquid restrictions. They are also lighter to pack. Right now on Amazon there is a $2.50 coupon for your first order of NurturMe. You can read my review of NurtureMe Food Pouches here. This is a genius invention! Blowouts never happen at a convenient time, and it seems to me that the airplane cabin pressure might increase the chance of this occurring. I used this for my son when he was an infant and it worked just as intended. Great Amazon Prime sale! For one day only, you can become an Amazon Prime member for just $79 (20% savings on their regular $99 price). We use Amazon Prime regularly for the great prices and convenience. Most items include free 2-day shipping for Prime Members! Order supplies (diapers, toddler snacks, etc.) to ship directly to your destination. Receive last minute items you forgot to buy in time for your trip. Shop and compare travel items from the comfort of your home. Use Amazon Video to download free TV shows and movies before your flight. Use Amazon Photo Storage for unlimited free photo storage (and limited video) to organize and back up your travel pictures. Check out all the benefits of Amazon Prime Membership here: Amazon Prime Benefits. The $79 sale is for one day only, November 18, 2016. It is for new members only. Amazon Prime Sale starts on 11/18 at 12am Eastern time and ends at 3am Eastern 11/19. Bookmark this page for easy access to the deal and click here to get the deal. As parents, our job is to keep our children safe. When traveling, that job doesn’t change, but the surroundings and dangers are different from at home. 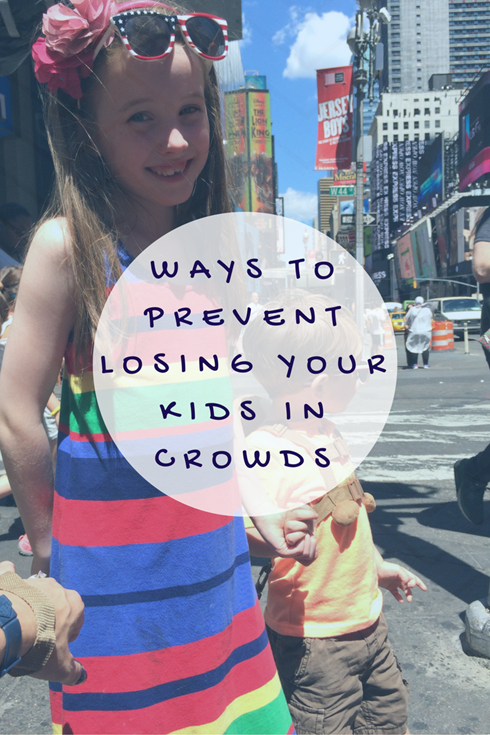 Here are ideas for ways to prevent losing your kids in crowds. Even the most compliant children could get separated in a crowd, so you need to have a plan to make sure your child is safe. (Every Tuesday I post new travel tips on this site. Be sure to check back each week for a new tip! Subscribe to our emails to be notified of new posts.) Looking for specific tips? Comment below or on our social media pages (Facebook, Twitter, Instagram), and I’ll write a blog post just for you! Most children, when they get separated from their parents, naturally tend to run around looking for them. Once in the grocery store, my daughter thought she lost me but was only about 5 feet away. I watched her panic and start to run down the aisle (of course she was running away from where I was standing). I called her name and was quickly reunited, but you can see how it can be dangerous if the child follows their instinct to run looking for you. They are more likely to become lost! If your children are older they may be able to safely find a prearranged meeting spot if you get separated. Be sure to talk about where that might be as soon as you enter a crowded venue. *Some of the links in this post are affiliate links. I may receive a small commission when you make a purchase through these links. I appreciate your support! 1. Road ID: My daughter used to wear this all the time. Her dad wears a Road ID every time he goes for a bicycle ride, and she wanted to be like him. If your child often runs away from you this is the form of ID I would recommend. You can buy the original ID or Interactive. The Interactive feature includes Emergency Response support. For $9.99/year (first year free), your ID lists a website where emergency personnel can find your emergency contacts and medical information. Again, if your child runs away a lot, this is a really good option! SmartKidsID has a similar bracelet, with an app to store information that can be shared with emergency personnel. 2. Paper Bracelets: I ordered a set of these paper ID bracelets and they’re great for keeping in your travel bag. Put one on anytime you’re headed out into a crowd and then just cut it off at the end of the day. If your child is not fond of wearing the bracelet on the wrist, you could put it around an ankle or belt loop. 3. Sharpie: You don’t have to spend a lot of money to help keep your child safe. If you don’t have ID bracelets you could just use a Sharpie Permanent Marker to write your name and phone number on their body. I would recommend writing on their stomach for a place that’s out of sight but easy to remember. 4. Dog Tags: Another option would be to have a necklace made with your information on it. You could order something like these dog tags. If you have family in the military, then your child might be excited to be like them. Quack Like a Duck: A pilot told me he did this with his kids when they traveled through airports: Play a game where the adult is the Mama Duck and the kids are the ducklings. Have the kids follow you and quack at regular intervals so you know they are near. This is a great way to sneak in a lesson on nature and animal behavior. Backpack Harness: As mentioned above, the backpack harness is a great way to keep your young children close and safe. If you are afraid of being judged by others for “leashing” your child, don’t be. I took an unofficial Facebook survey and found that only a tiny percentage of the general population frowns on these harnesses and most people understand that it can be a life-saving device as it keeps your children near you and out of harm’s way. Read this post to see how I almost lost my son as he ran up the jet bridge and into the airport terminal before I could catch him. You can tolerate a few judgmental stares when you know you’re doing what’s best for your child’s safety. Stop and Go: This worked for my daughter, but not my son. When she was a toddler, we went to an open park and practiced “stop and go”. I would call out, “Go!” while also using the sign (American Sign Language) for “go”. I let her run a little while then called out, “STOP!” while using the sign for “stop”. I got in front of her, signing right in front of her body so she would have that visual along with my vocal commands. We played this game several times a week and after a few weeks she automatically responded when I called out “stop”. Train and bus doors close quickly, and much of the time they don’t reopen like an elevator door would if you put your arm or bag out to stop them from closing. When I was 8 months pregnant with my son, I was in New York City with some friends. The subway train was packed and we were squished into the middle of the car. When we got to our stop, it was difficult to get off the train because of the crowd. By the time I got to the doors, they were closing. I tried to quickly jump out when the doors closed right on my pregnant belly! Luckily I put my arm up between my stomach and the door, so I could keep the door from squashing my baby. But I couldn’t get in or out of the train! There were several moments of panic when a man finally jumped up and pried the doors open and I jumped out before the train started to move. Map out your stop. Before traveling by bus or train with your kids, look at a map with them. Show them where you are and where you are going. If you can get a paper map, highlight the route and give them a copy to carry with them. Tell your child to wait where they are if they get off the train/bus and you don’t. Teach them the same for elevators. It will be quicker and safer for you to back track to get to them then for them to try to find you. Instruct your child to get off at the next stop if they miss your stop and are separated from you. You’ll then know where they are waiting and can take the next train/bus/elevator, or even a cab to get to them. Do you have anything to add? Something unique that you do to prevent losing your kids in crowds? Share in the comments below! Your tip may come to the rescue of other readers! Did you know that some Boeing overhead bins have an assist mechanism? As a flight attendant who shuts hundreds of overhead bins each flight, I couldn’t believe I didn’t know about this until last year! 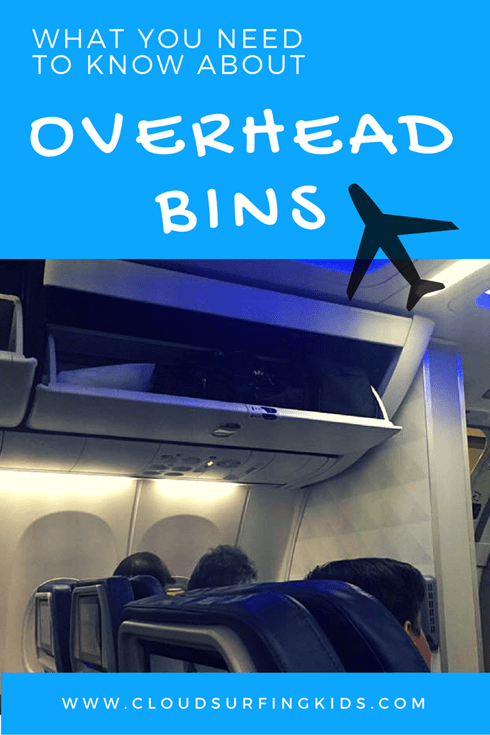 I had been shoving the entire weight of the full overhead bins when there was an easier way! Luckily I flew with someone who noticed I wasn’t taking advantage of this great assist mechanism and he told me about it. I made this video to share with you and with other flight attendants who may have missed the memo, as I did. I got mostly positive feedback from my video, from both flight crew and passengers who had not been aware of this assist mechanism. A few colleagues kind of made fun of me, “Yeah, we knew that already,” and “Yes, I knew this—I read the memo when it came out.” Oh well, you can’t make everyone happy. I figured that since this was something I had somehow missed I probably wasn’t the only one. Comment below if you knew about this assist mechanism or not. Next time you’re on a plane that has this, give it a test. See how much difference it makes when you flip the switch vs. not using the assist. Tell us what you think! On topic overhead bins, be careful when you purchase luggage that claims to meet airline sizing restrictions. Sometimes the wheels protrude beyond the approved measurements or the luggage expands to a depth that won’t fit in overhead bins. I advise bringing a measuring tape if you are shopping in person for luggage. And remember that different airlines have different bag size restrictions. Also different aircraft have different sized overhead bins, so the excuse, “It fit on my last flight” doesn’t always fly. When I’m traveling with my kids (who are still young: age 8 and 3), I find it easiest to pack my things along with the kids’ in a rolling duffel bag and I check that bag. Then for onboard I pack a backpack and tote bag for me, my 8yo carries a rolling backpack, and my 3yo carries a mini rolling backpack. Everything fits under the seats (my tote bag fits alongside the mini backpack). Then I don’t have to worry about overhead bin space at all. One cool thing in larger, more modern Boeing aircraft is the newer Space Bins, which hold 50% more bags but the way they are designed, the weight loads toward the bottom of the bin and doesn’t require any assist mechanism! I haven’t flown yet on a plane that has these, have you? 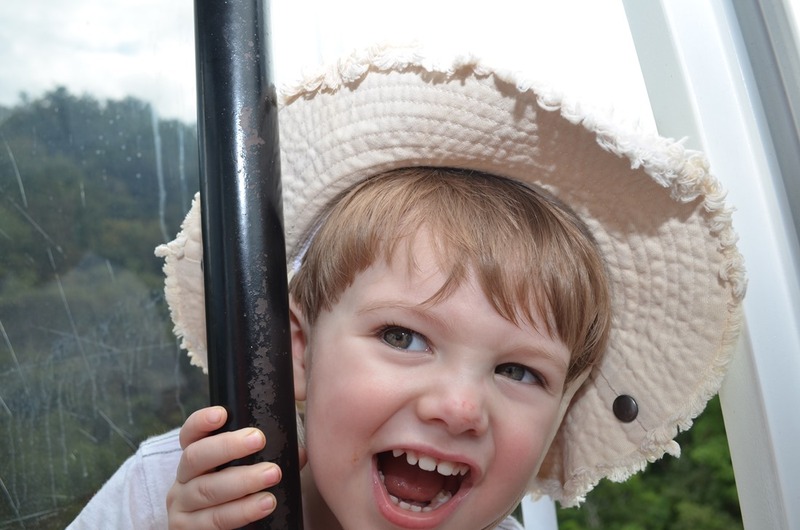 A reader recently asked for tips for flying long haul flights with toddlers. So far the longest flight I’ve been on with my kids was scheduled 6 hours, becoming 10 hours long with delays and diversions. I reached out to some of other great family travel bloggers and they shared with me some of their best tips for flying long haul flights with toddler. 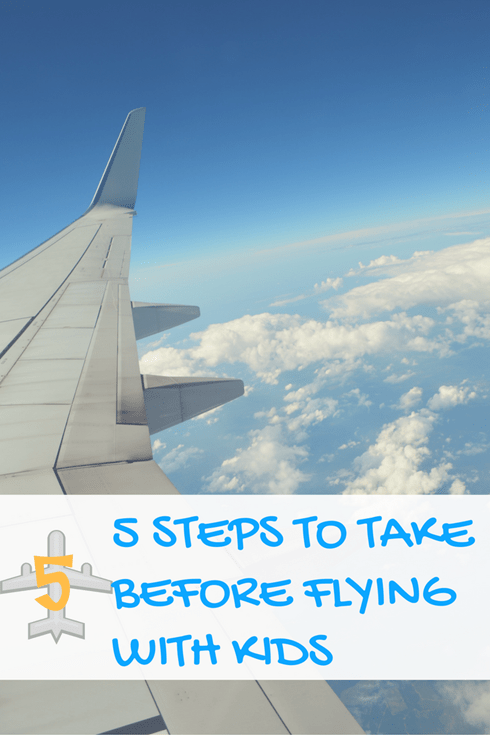 These are great tips to follow even if you are on shorter flights with toddlers. Comment below if you have any tips to add! I’d also love to hear which tips help you the most, so come back and comment after your flight! Although toddlers usually require more attention in flight than older kids, you can still have a fun time traveling with them. Be as prepared as you can, slow down and enjoy the things they find joy in, and don’t stress when schedules are interrupted. When your toddler gets fussy, just focus on meeting his needs and remember we all get a bit fussy when tired/hungry/hot/cold/irritated. One of the best ways to help your child calm down when irritated is to show empathy. “I understand” are such useful words. Kid World Citizen shares how they followed a routine to get through the flight: “This is what our 13+ hour flight looked like with a 3 year old: snack, walk to potty, read books; snack, walk to potty, put stickers in in-flight magazine, color; snack, walk to potty, play dough, play peekaboo with neighbors; snack, walk to potty, beg Vivi to snuggle and rest for a bit (to no avail).” Read here about their 13 hour flight from the US to China. One of the best resources I’ve found for travel tips is the book The Travel Mama’s Guide. This book gives so many great travel tips, including an entire chapter about flying with kids. Even though I have lots of experience with flying with kids I still found a few great tips in this book. Packing lists, entertainment ideas, snack ideas and humorous stories are all included in the chapter on flying. The rest of the book gives tips for all kinds of travel, from road trips to camping, hotels to hostels. It’s time for me to read this book again! There’s so much great information for all types of travel! “When you travel with a baby the bulkhead seats are a lifesaver. Not only does it offer more legroom, which is great for a crawling baby, but often comes with a bassinet for sleep time. When traveling with your child, it will help everyone function better if you consider your child’s temperament. Plan activities and distractions to meet your child’s needs. Shelly Rivoli’s Travels with Baby has a blog series on temperament. Read these to determine your child’s nature and find ways to travel well with them. Positive, Negative, High-Sensitive, Low-Sensitive, Intense, Mellow, Slow-Adapting,….What type of child do you have? Be sure you pack everything in your carry on bag that you might potentially need for the next three days. That way if your checked bags don’t make it there with you, you will have what you need until you either get your bag or can get to a store. Diapers and wipes, snacks, thermometer, fever-reducing medicine, several changes of clothes (for everyone in the family) are examples of the things you need to be thinking about when packing your carry-on bag. Click here to read a more detailed list of what I pack in my carry-on when flying with toddlers. 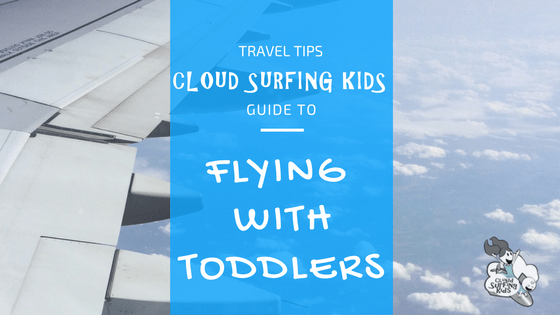 Do you have tips to add for flying long-haul flights with toddlers? We’d love to hear them! Comment below to help other readers as they plan for their flights. Have you ever thought of becoming a Lyft Driver? My sister, Becca Davis, has been thinking about it for a while and decided to give it a try in the Dallas-Fort Worth area. 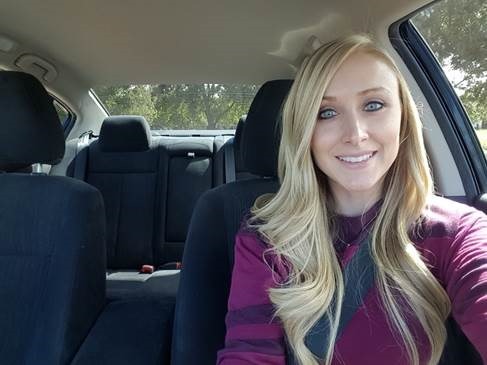 Here is some useful information about becoming a driver for a ride share company and some of her stories from her rides. I’m always looking for ways to stay busy and make some extra cash, so I decided to try out being a driver for Lyft during the early morning, evenings & weekends. Here are some things that I didn’t know and think you might be interested in. Also, I’ll tell you what some of my passengers are like, to thrill anyone curious. Be sure to scroll to the bottom for discount and reward links if you want to become a Lyft passenger or Lyft or Uber driver. Most of my Lyft passengers tell me that they’ve tried Uber and prefer Lyft because it feels safer and they enjoy the experience more. Lyft does a national background check on all of its drivers. Uber only does a state background check. Unlike Uber, Lyft gives the opportunity to tip through the app, so drivers will have no cash on hand, which seems safer to me. Both Lyft and Uber take 25% of the trip charge, the driver get the rest and gets to keep 100% of their tips. The trip rate is calculated by miles and time but most trips come out to be about $1/mile. Both companies have opportunities to rent cars if you don’t have your own or if you don’t want to put the wear and tear on your car, or my biggest fear – have your car vomited in. Both companies have great referral incentives for the passenger and the driver. If you’re downloading either app for the first time, make sure to find a promo code. I will gift you discount codes in links at the bottom of this article. Airport rides are my favorite and safest! So, I’ll start my passenger summary with my favorite ride. I picked up a man from work and found out we were headed to the airport. He was on his way to Nebraska with his fiancé to plan their wedding. I shared parts of my wedding and honeymoon that I loved or regretted as he asked for my advice and told me what their plans were so far. They plan to get married this time next year so they’re way ahead of me, as I only took 6 months to plan my wedding. He was so nice and easy to talk to; it was like giving a friend a ride to the airport. He gave me a $5 tip. Good to Know: The rider gets charged for the airport toll through the app and the app reimburses me. Travel Tip: Make sure you have a plan for safe seating if you’re bringing a child. Drivers most likely will not have a booster or car seat and you are required to follow State laws regarding car seats. Don’t worry, I was parked! Most of my rides are very comfortable. I’ve met a lot of really nice people and it’s been fun to get to know them a little bit. I’ve picked up students from school to take them home, picked up people from work and dropped others off at work. I’ve picked up a man in a wheelchair, which disassembled and fit perfectly in my trunk. I’ve taken a father and daughter to an Oktoberfest and I took a couple to the State Fair of Texas for a concert. Unfortunately, I’ve also encountered a sketchy ride. I knew I shouldn’t have accepted the ride because it was about 15 minutes away. I usually try to accept rides 7 minutes away or less. Driving to their pickup location is on the driver’s dime, so you don’t want to drive far just to start the trip. The passengers smelled like marijuana, they asked me for a bigger discount because they didn’t have much money, they asked to smoke in my car, they said they were so desperately needing this ride to “drop off a friend’s wallet”, the destination was in a bad part of town – just a few red flags warning me about how this would turn out. They changed the location to farther than originally planned during the drive, and then asked me to take them back home after their transaction. I quickly learned this was probably some type of drug deal. Again, being too nice, I waited for over 20 minutes at the destination (a gas station) for the guy to return to the car. He never did and I finally told the girl to get out of my car, the trip was over. I did make sure that she found him. He wasn’t happy that I was leaving without them, but my heart was racing the whole time I was waiting and it took me that long to finally stand up for myself and leave the unsafe situation. You never know who you’ll get when you arrive to the pickup. You also don’t know where the final destination is until the passengers are in your car. This is what I don’t like about driving for a ride share app. I learned a lot from that last ride. Now I know can put my foot down and kick people out of my car if I don’t have a good feeling about it. I have decided not to drive after about 8pm. I have also decided to try to do most of my work at airports. Drivers need an extra permit to pick up at DFW and Love Field airports, and I will be working towards attaining one. Drivers do not need a permit to drop off at the airport, but you never know if a ride will be headed towards the airport. Good to Know: Sometimes a driver can’t find the passenger and needs to call them or a passenger is taking longer to get ready and need to text the driver to wait. The app encrypts both phone numbers, so no contact can be made after the ride. Travel Tip: Remember to check for discount codes out there for Lyft. Discounts vary by city. Try searching Google or Instagram to find the discounts. If you are using lyft for the first time, you can get $50 toward your next rides by using this link. Interested in becoming a Lyft Driver? Click the photo below and receive a $100 bonus after giving 50 rides within 30 days! Thanks for reading! Comment with any questions you have about Lyft or Uber, either for riding as a passenger or as a driver. We’ll do our best to answer your questions. If you enjoyed reading Memoirs of a Lyft Driver, we would love it if you comment and/or share this post. If we get a good response we will continue to post stories of Becca’s Lyft driving experiences. 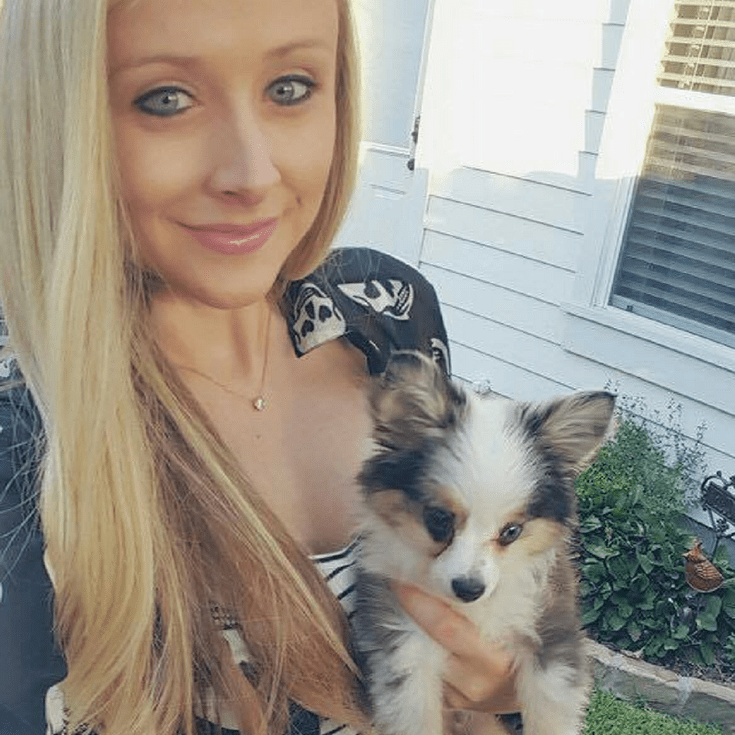 *Becca Davis lives near Fort Worth with her husband and adorable little puppy, Leo. When she’s not driving for Lyft, she keeps busy with her job at Samsung, working out in the gym, working at Cheerful Heart Gifts & Boutique in Glen Rose, walking her dog, and playing with nieces and nephews, and taking Hip Hop dance classes. In her “spare” time she shares videos on YouTube to help others with busy lives find ways to eat well and stay fit. You can follow her adventures on Instagram.